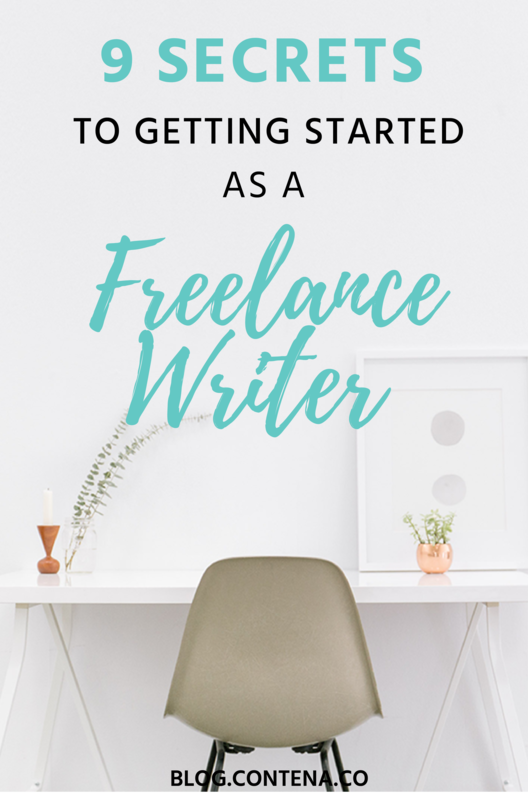 Have you been thinking about getting started as a freelance writer? Maybe you’ve seen articles (like ours!) about how you can make money working from home by writing content for other people. It’s true- you can! At Contena, we want to help people reach their freelance writing goals, whether that’s making some additional income on the side, leave their current job to be a full-time freelancer, or somewhere in between. It can feel overwhelming to start your freelance writing career, so we wanted to bring some of our best advice together in one place for you. Though you don’t have to have much experience or “stuff” to get started as a freelancer, it’s helpful to have a few ducks in a row. If you’ve never freelanced before, you’ll want to do your homework, getting comfortable with things like writing pitches, having a portfolio, and the business side of freelancing. You can read books, take courses, or try trial and error, or you can sign up for Contena.co where you get the training you need (it can be done in a weekend!) to launch your freelancing career. Curious about what a Contena membership is all about? Check out our FAQ. Once you’ve done some of the research about how to be a freelance writer, you’ll probably realize you need a few tools to show off your skills. When people are hiring you for your writing ability, you may want to set up an online portfolio or writer’s website to highlight your best work. This is also a way for people to find you (isn’t that awesome!?). Though resumes aren’t always requested, it’s useful to have one ready, and know how to write one specifically for the world of freelance writing. While there are many different types of writing (research-based, technical, more casual, etc. ), no matter what niche you write for, your writing should be, at minimum, good. Ideally, it’s better than good, especially when you’ve been hired for a job and you’re submitting your article. Each writer will have their own process for writing, but at the very minimum you need to proofread your work. You can use programs like Grammarly to help you improve your writing, but sometimes it’s a good idea to take a course, or work with a mentor or editor who can help you improve. However, if you’re a Contena member, you have the option of working with a Contena coach who will help you with your writing, from pitches to the articles you submit. To niche or not to niche? If you’re not even sure what this means, it’s basically about narrowing down what you write about- specializing in an area. For example, writing about freelancing is one of my niches. I also write about mental skills in sport, another niche. Sometimes, I write parenting articles- a third niche. Pretty much everything I write falls into those three categories. It’s okay to start off writing about a lot of areas to help you narrow down, but you may want to focus in on a niche, paying special attention to niches that pay well. Even when you’re driven to be successful, you also likely need to be patient. Many people start off part-time (with another job) and then transition to full-time freelance writing. This is a great way to build your business. And, the life of a writer often includes rejection, which is normal. But, the good news is, you can use this rejection to your advantage. Even if freelance writing is your current side-hustle, there are other side-hustles you can do while you’re writing. Once you start getting more pitches accepted and hired for more jobs, you also need to understand the money side of freelancing. Because you want to make money, right?! Overall, it can be very simple sending invoices and receiving money, but you also need to be organized and prepared for taxes. Everyone will have different goals. And we all get there in different ways at different times. It’s important to remember that you can branch out in the areas that you’re writing in, you can think beyond writing to make money, and you always want to make sure you’re getting paid what you deserve for the work you’re doing. Also, continue to work smarter, not harder, by upping your productivity. Continue to develop yourself and your skills by reading great books, and when you’re dealing with writer’s block or feeling uninspired, don’t panic- you’ll get through it. As important as your writing is, the mindset that you bring to it is just as (I’d argue more) important. You want to approach being a freelancer with a growth mindset, as well as make sure you have the right frame of mind about yourself and what you do. As we already mentioned, rejection is normal; so is doubt as a freelancer. We all get plagued by negativity from time to time, but you can learn to turn that thinking around. 9. Remember that you can do it! Being a freelance writer is an amazing career- you have more flexibility, can take vacations differently than other people, and the health and lifestyle benefits are amazing. There are so many ways to create a successful career, so don’t give up. When it comes to getting started as a freelance writer, there’s not much you need. The barriers to entry are super low, so if you haven’t started, what’s holding you back? This is our last mention of a Contena membership (for now! ), but if you’re interested in kick-starting your freelance writing career, check out our FAQ, and sign up for a Contena account when you’re ready.